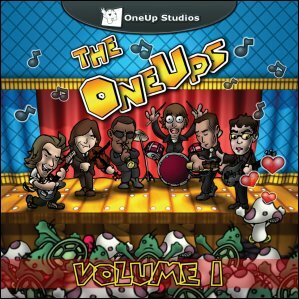 SqaureDance is a fan made project CD from OneUpStudios letting a group of people remix their favourite songs made by Square Soft and releasing them as a compliation. The result is something far better than just amateur works, these songs are very groovy indeed. The opening track “Hip-Hop Corridor” is a fairly standard but highly produced remix from Chrono Trigger that uses various synthesizers to provide a mellow dramatic feel. The beginning is masterful as it comes across like a space odyssey. Following that comes the epic length of “Soulless Village” from Final Fantasy IX. This comes across as a dance floor mega hit, and if it were released properly I’m sure would do well! The song is faithful to the original and is very pleasing to listen to. “Spacecat” from Chrono Tigger comes across like a space movie and then continues to send waves of sound through your speakers. The instrumentation in this song is very close to real life (especially the string sections) and makes for a complete change of scene in the album. “Hello World” from Secret Of Evermore is a nice song in itself but I don’t think it has a strong enough main melody to really compete much with the surrounding songs. The instrumentation is still top class though. “Cyan” from Final Fantasy VI is geared towards grizzly old skool music from the early 1990’s and the songs chorus makes the song as it uplifts you and takes you on a journey – great ear candy. In between the chorus’ though is fairly cluttered techno-babble but on whole it’s a great song with a lovely ending. “Forest Animal Groove” from Secret of Mana is done very much in the style of the how the Secret Of Mana’s OST would have had it. It has a beefy, grizzly baseline and some cutesy tunes, but never really gets going and so is the laid back tune of the CD. “To Far Away Times” from Chrono Trigger is a magical adventure trip with lovely fairy lights guiding the tune through with a dance beat bumping away. It’s a simple but very effective and enjoyable remix. “World Of Ruin” from Final Fantasy VI is a gothic piece that has an almost jungle beat to it. The church organ though begins to get a little repetitive towards the end repeating the same 4 chords to the end but it is a bit more of a welcome quirk from the normal dance music you’d get! “Adventurous Break” from “Final Fantasy Adventure” is perfectly pitched. It has regular chord changes, regular dips and rises in its song and the actual main tune is good. It comes across as a drama piece more at times with some excellent effects. “Cecil’s Jinn and Juice” is mixing two songs from Final Fantasy IV and is done in a relaxing manner that rewards you with each listen. The lead is taken by wind instrumentation and is defined and superbly realised. The change over between the two songs is absolutely spot-on and marks this as one the real stand out tracks for the album. Put simply – this song is a masterpiece. “Reiterated Inspiration” mixed from Chrono Cross begins with a lovely acoustic guitar that is added onto by other lovely instrumentations to make a beautiful dramatic piece. It’s the kind of thing you’d expect at the end of a film when you see the main character make their final goal. It’s another masterpiece on the album and really sticks in your mind. The best way to describe this song is a dreamscape. “Magus” arranged from Chrono Trigger is a typical trance remix that is pleasant to listen to and has a rather scary voice in the middle of it. Apart from that its run of the mill stuff but done to top class quality. “The Day Will Come” taken from FFV starts of beautifully with a lovely piano introduction that envelopes into a great piece of trance music that is faultless. “Star Stealing Girl” from Chrono Trigger uses some excellent vocal samples to set the song apart from the rest and make it a unique experience. “Forest Starlight” from Chrono Trigger also comes across more of a jazz pop song and slows the speed of the album down for a nice relaxing song that very intimate. The final track is “The Ultimate Being” from Parasite Eve that despite some lovely effects is just a bit too chaotic and cluttered at times. SquareDance is all about how you like the genre. If you love dance music, this will be right up your street, but for the rest of the VGM listeners out their, you’ll be able to appreciate most of the arrangements that you’ve had first hand experience, but skip over the rest without a thought. Paying for this quality of remixes should never pose a problem however, there is so much original content that’s not even in the same ball park of SquareDance, even if I don’t always feel in the mood for the album. SquareDance is ambitious and somewhat the cement on what would become a great section of VGM, the fan remix. If there’s not a celebration – I don’t know what is!